Planning a wedding can be overwhelming and talking about a budget can be a touchy subject. Here are some tips to help navigate the sometimes rough waters of budgeting for a wedding. Set Your Budget and Stick to it! The average cost for a wedding in the United States is $25,000 although most couples spend less than $10,000 on their big day. It is important to set a budget early on in the planning process and to commit to that number throughout the planning period. Talk to your partner and make sure you both agree on what the budget should be. This will result in less stress and anxiety. Remember- you are planning a happy occasion! There shouldn’t be any added stress! Beware of Hidden Wedding Costs. There are so many things that can slip your mind when planning your wedding. Here are a few costs that can creep up on you and cut into your budget in a big way. Stamps– The cost to send out bulky, layered wedding invites can cost up to $2 per invite. Save by choosing flat invites and paying the regular postage rate of 49 cents per invite. Cake Cutting– Many reception venues and restaurants charge a fee to cut your wedding cake. This charge can run between $2 & $5 depending on the venue. Sometimes, you can negotiate a lower rate or choose a venue that does not charge a cutting fee. The Guest List- Choosing who to invite can be overwhelming. Sit down with your partner and discuss who you would like to invite. Decide on a number and, just like your budget, stick to that number! The more you add to the list, the higher your budget will go. 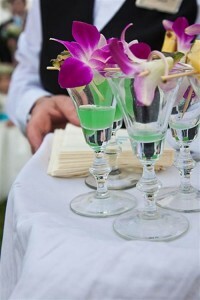 Adding additional guests for your reception can cost upwards of $150 per person which can really add up! Save Money by Making Wedding Favors Yourself. Take the time to make homemade wedding favors for your guests. It will be fun and your guests will appreciate the effort you put into it! This is also a good way to spend time with your partner, mother, sisters, bridal party or whoever you decide to make the favors with. Take a look at our Pinterest board for ideas on homemade wedding favors that your guests will love. The Dress. A wedding dress can be one of the most pricey items you purchase for your wedding. Save money by shopping for a dress when stores are having sales. If you are not having a traditional wedding, you may be able to find a dress somewhere other than at a bridal store. Another point to remember is that alterations can add up quickly. When looking for your dress, keep this in mind. It can make a big difference in the end.